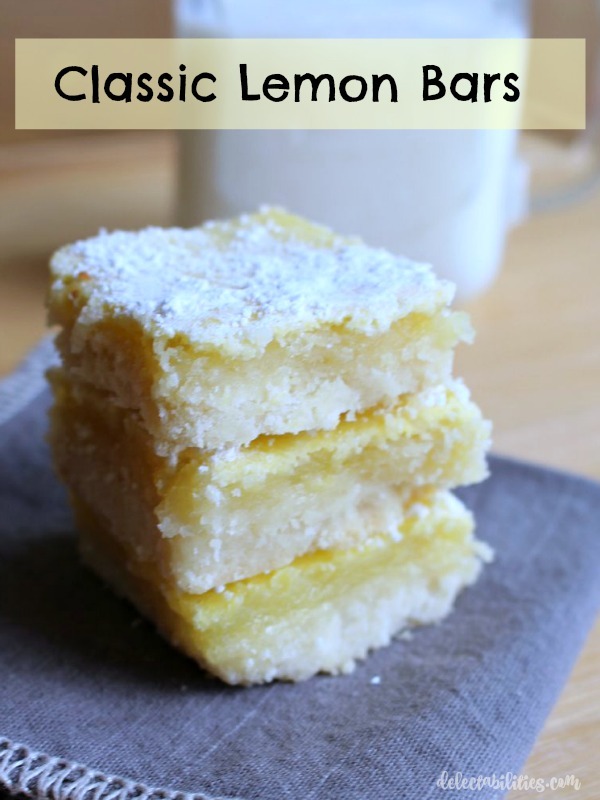 Lemon bars are one of my favorite desserts, but not one that I have very often. Not only because my husband dislikes all things citrus, but because I don’t think of making them very often. My brain, and my tastebuds, are much quicker to jump to brownies or cookies than to lemon bars. And then if I have them at some sort of social function, I feel like I’ve had my fill for awhile. But I was very grateful when someone at Jason’s work requested lemon bars. I got the chance to make and eat a few and share the recipe with you. And now I know that my daughter also does not like lemon things. Great. So, these are your very basic lemon bars. Yes, the kind with the basic but delicious crust and then the typical creamy lemon filling all sprinkled with powdered sugar. Sometimes it’s just best to stick to a classic. 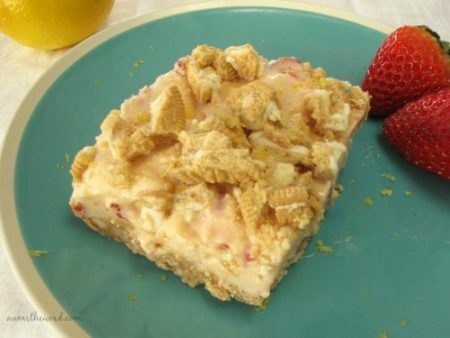 Janelle also has a recipe for lemon bars, but these have an amazing crumb crust and topping. Totally nummy! If you’re a lemon fan, you should try them out too. Combine softened butter, 2 cups flour and 1/2 cup sugar and press in to the bottom of an ungreased 9x13 pan. Bake for 15-20 minutes, or until firm and starting to golden. In a medium bowl, whisk together 1 1/2 cups sugar, 1/4 cup flour and zest of one lemon. Whisk in the eggs and lemon juice*(see note). Pour over the baked crust and bake for an additional 15-20 minutes. They will firm up as they cool, so don't cook too long. Sprinkle with powdered sugar, cut into bars and serve. *For the lemon flavor, you definitely want at least 1/2 cup of lemon juice. I used the zest of 1 lemon and the juice of 3 to get almost exactly 1/2 cup. These are the perfect little cookies! 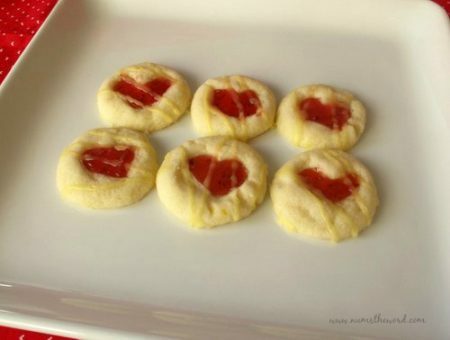 Butter thumbprint cookies flavored with lemon zest and topped with a dab of strawberry jam.